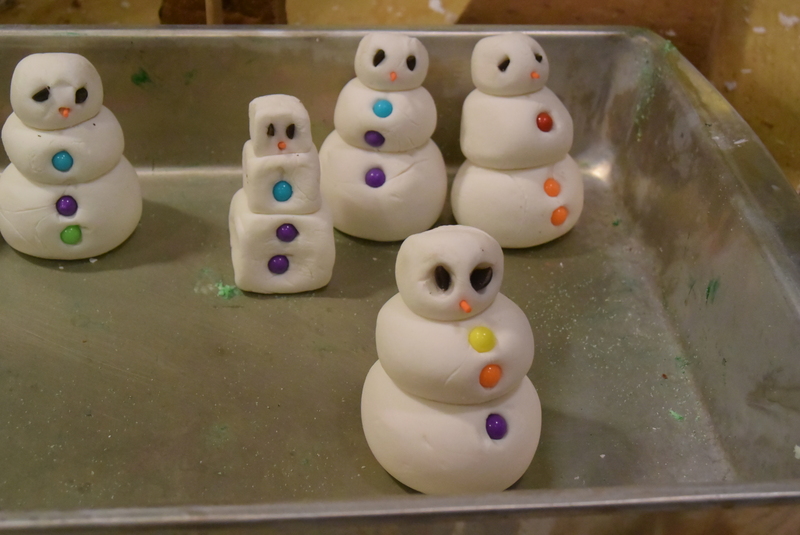 Take a stroll this week through the student lounges by the Great Hall of Purdue Memorial Union and gaze at the gallery of edible edifices on display, constructed by teams of students and staff from campus dining courts and caterers. 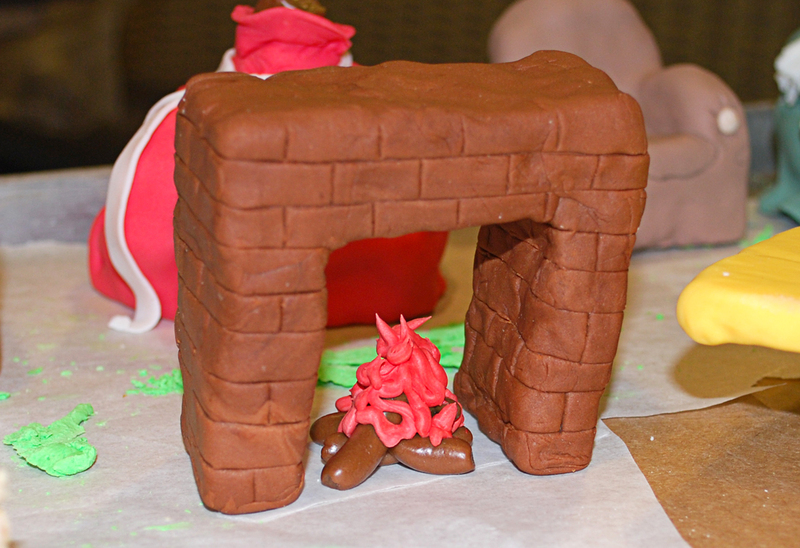 These candied citadels are entries in the 2014 Gingerbread Contest – see the gallery on the PMU Facebook page! 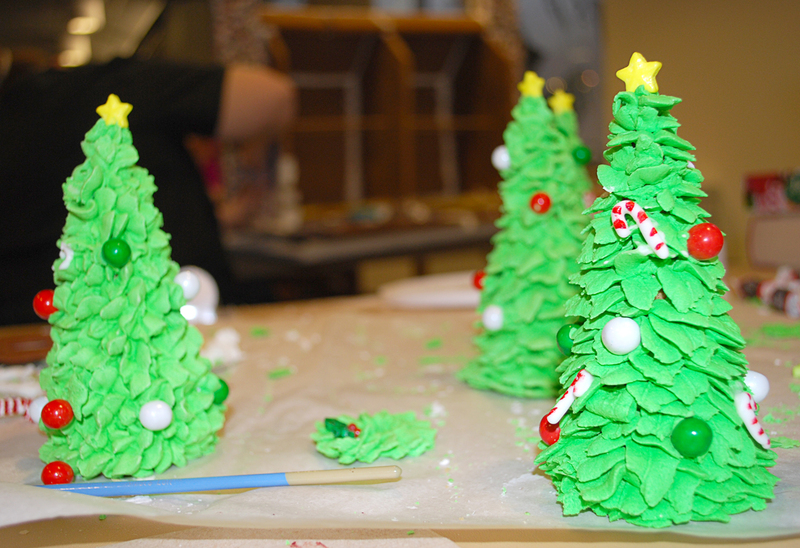 This year’s theme is “Tunes of Christmas,” and each gingerbread house was judged by a panel of Housing & Food Services administrators and voted on by students and staff. The panel is evaluating entries for appearance, creativity, detail, difficulty, adherence to the theme and student/staff participation. Fans could vote based on whatever criteria they choose, such as which house you’d most like to take a bite out of. Eating the entries on site is possible, but discouraged until everyone’s had a chance to see them. The primary rules given to participating organizations (all five residential dining courts, the Athletic Dining Room, PMU Catering and the Central Production Kitchen (CPK)) are that (1) all components of the houses must be made of edible products, with exceptions for the base and any battery-operated devices (such as lights). 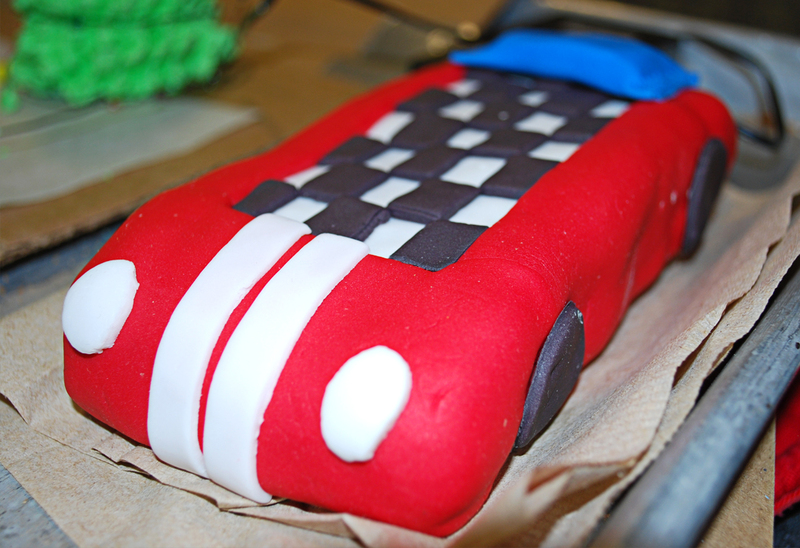 Edible materials include candies, nuts, cereal, crackers, pasta, ice cream cones, pretzel sticks, gum, etc., and (2) that student workers most do a minimum of 50 percent of the design and construction. 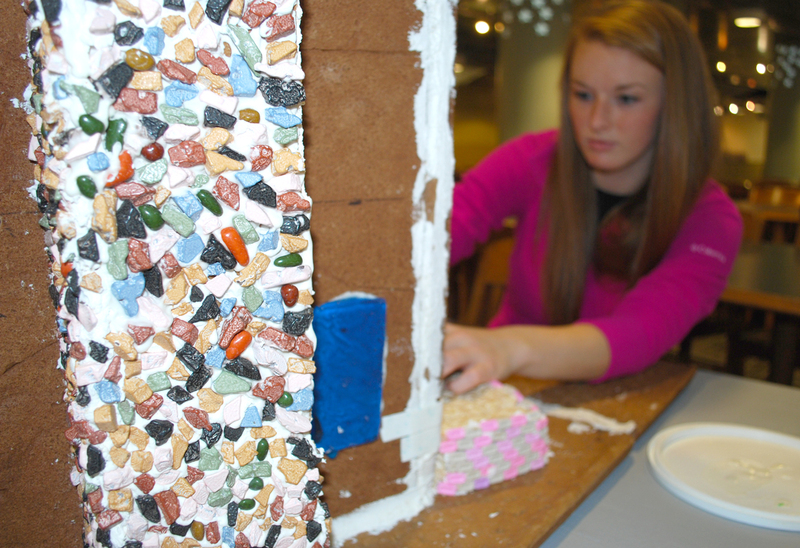 The panel judged the gingerbread houses Dec. 10 and will award ribbons for first, second and third place. Earhart Dining Court is the defending champion and home to the traveling trophy. The judges’ first place winner will receive a bowling and pizza party at PMU and a $1,000 prize to be used in the dining operation. The people’s choice winner also receives a traveling trophy, with Hillenbrand Dining Court the reigning winner of the fan vote. The winners will be announced Friday afternoon on Dec. 12. Why did you choose to come to school at Purdue? It had the type of thing I wanted to study like STEM majors; it was the only school I applied to. Why did you decide to become an RA? I liked Res Life, and I was looking for more leadership positions so I applied. Interacting with residents is great. Learning about their lives is fun. That whole community aspect is really great. What are some tasks you have that you were not expecting? Sort of like, cleaning up after people, if they leave a mess or if someone pukes somewhere on a weekend or after hours I have to clean it up. I have a mostly international population in single rooms, and they are also older so it is very hard for me to interact with them and build community, because a lot of them are more shut down and introverted, and living in my hall because they don’t want the traditional res hall experience so it’s a lot harder for me to build community and sort of network people that way. What advice would you give to a resident who wants to become an RA? Talk to your RA about it; start hanging out with your RA. Talk to the RA supervisors, talk to them about the application process and sort of interact with them. If you have a chance, get involved in the hall club because that looks good on an application, just being involved in res life helps. How can you apply your experience as an RA to your future career in the real world? At some point I want to be in a management position, running some sort of business. So I think just being able to interact with people and how to handle crazy off-the-wall situations will be applicable to that. Why should students want to live in Hawkins? Hawkins is quiet, it’s really nice. Its quiet all the time. I think the RA staff is great, we’re fun to hang out with. It’s really close to campus, close to academic campus and Chauncey so all the food and fun things that happen. We have a really big kitchen so it residents like to cook they can cook in the kitchen, and you don’t have to have a meal plan to live at Hawkins so if you don’t want to cost of the meal plan Hawkins is good. What is your favorite thing to eat in the dining courts? Tomato basil soup at Windsor, for sure. If you could have any TV/Movie character as your best friend who would it be, and why? Probably the genie from Aladdin, because he seems to be really entertaining to be around and is probably good for a few wishes. I wanted to affect first year students in a positive way. The connections being made, being able to see people who came in with really no friends find friends – the community building. We have to do monthly reports on conversations that we have with our residents. We have to go into detail about how many times we talk to our residents and be very specific. It can be kind of a headache sometimes. Probably dealing with disciplinary issues. You want residents to succeed and you have to enforce the rules. Make sure that you meet the requirements. You get out what you put in, so anticipate getting a lot out of it. I want to go into HR where I’ll be working with employees every day, in a similar way that I do with my residents. Why should students want to live in Owen? The community is really strong, probably the strongest on campus. My first year I lived in First Street, and I moved to Owen because of the community there. There’s a really strong bond that people form. Rafael from the Teenage Mutant Ninja Turtles, because he’s awesome and I would like to hang out with him for a day. That would be cool. Purdue Dining & Catering believes healthy Boilers are happy Boilers, so to promote healthy habits on campus we’re holding a #HealthyBoiler social media contest. All you have to do is share a photo on social media of a healthy activity (like eating your vegetables or going for a walk) with the hashtag #HealthyBoiler and you’re eligible to win prizes! Entries will be judged by a team of administrators, with prizes awarded for posts that creatively convey the message of #HealthyBoiler. Visit choosemyplate.gov for information on healthy eating and much more. Each entry must be published on a social media platform with an image and the hashtag #HealthyBoiler. Entries will be considered on a monthly basis for the months November, January, February and March. To be eligible for that month’s prize, an entry must be posted within that month. You must be a current full-time student at Purdue. Your full name must be listed either on your profile or included in your post so that we can verify your enrollment. Your profile/post settings must be set to public. The four monthly winners will receive a free Healthy Boiler T-shirt! Winners will receive their award during fall semester of 2014 or spring of 2015. Students will be notified of their winnings via the social media platform used to post. Staff will then work with the student to deliver the prize. If participants do not respond to notification within 30 days, the prize will be forfeited. No cash value can be exchanged for prizes. I’ve always been interested in helping people. Having a psychology background, and I used to want to do mental health counseling, I thought I might get a little peek into that by just helping people with their life problems and things they encounter every day. To help people build relationships and make friendships. My favorite part of the job is that I get to meet new people every day. I think it’s pretty awesome to just talk to somebody and hear about their life, differences they have and where they came from, and get to know them. We have to shovel snow some mornings at 5 a.m. so that when students go to class they have a path. The service staff doesn’t get there until 8 a.m. sometimes, and they want the areas 10-15 feet from the doors and entrances to be clear of snow and ice. We have to lay down salt the night before and in the morning get up at 5 a.m. and shovel. So that was unexpected. Other than that, as you get to know the job other people will come to you and ask questions, and that takes a lot of time and energy just explaining things to them and helping them through situations. That’s more in the second year, being a veteran and being able to help other people doing the job. My biggest challenge as far as being an RA is getting people to step out of their comfort zone. There are quite a bit of guys on my floor this year that are comfortable just playing computer games and don’t ever want to leave their room and talk to people. Specifically that has been difficult trying to get them to open up and actually speak to people and have a social life. Well, if you plan on being involved in a lot of other stuff while being an RA, don’t. Most of the time people don’t anticipate it being as much work as it really is, and random stuff comes up all the time. I feel like you can really only be committed to one or two organizations outside of it because you have your own schoolwork and you have your job. Depending on how much time and work another organization or involvement would be, it’s probably going to overload you if you try to do too much. They talk about being an RA as a huge leadership role, and I’ve found that probably 95 percent of the time I am leading the people on my floor to do things that are productive and helping them be successful. I am constantly trying to be a leader for my staff and go through procedures and administrative tasks the way they ought to be and not trying to cut corners. So I think helping to understand leadership and how that can benefit me and help an organization to work well if I am leading people to do the right things. Why should students want to live in Cary? A lot of people will argue that it is the best hall on campus. But that’s mostly people that live in Cary. I would say the thing about Cary is we have significantly lower conduct problems than other halls, so there are not a lot of people getting written up. People find pride in their community here and they are taking ownership of things in their hallways and getting involved in meeting new people constantly. I think those things lead to lower conduct issues. If you could have any TV/movie character as your best friend, who would it be and why? Probably Matt Damon, because I love Boston accents and he has the best Boston accent. He’s just a super awesome actor and it would be awesome to hear his Boston accent all the time. 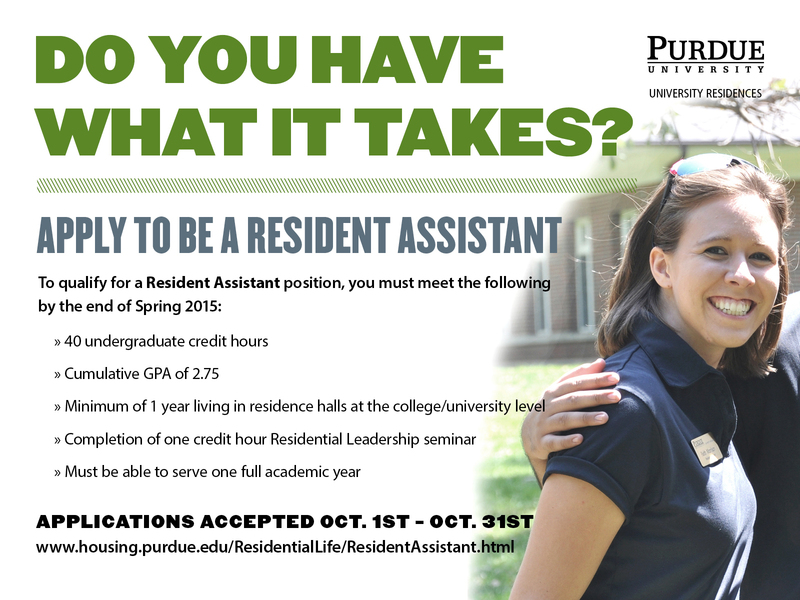 If you have what it takes to be an RA, click here to apply! Click the flyer to apply!